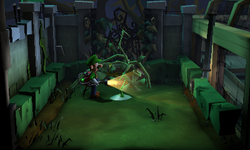 The West Garden is an outdoor area inside of the Haunted Towers in Luigi's Mansion: Dark Moon. The West Garden can be accessed by revealing a hidden door on the western wall of the Tower Lobby. Luigi can also get a glimpse of the West Garden from the Greenhouse. This area has shrubbery on three sides and a treasure chest guarded by vines. On top of the left wall is a stack of bills. There is an small alcove to the south with a dried up plant and a pair of tools. During B-1: A Job for a Plumber, the West Garden has a small, watered sprout in the middle off the area. There is nothing that can be done about the Treasure Chest being guarded by the vines. In B-2: The Pinwheel Gate, the sprout turns into a carnivorous plant and attacks Luigi if he steps on the grass. Starting from B-2: The Pinwheel Gate and all subsequent missions, Luigi can reveal the missing pipes in the Tower Lobby. Doing so causes the water to fall onto the dried plant in the alcove, turning it into a thorny plant. Using this plant, Luigi can kill the carnivorous plant guarding the treasure that contains an emerald.